Topics Coverage Summary: Use and implementation of basic data structures including linked lists, stacks, and queues. Use of advanced structures such as binary trees and hash tables. 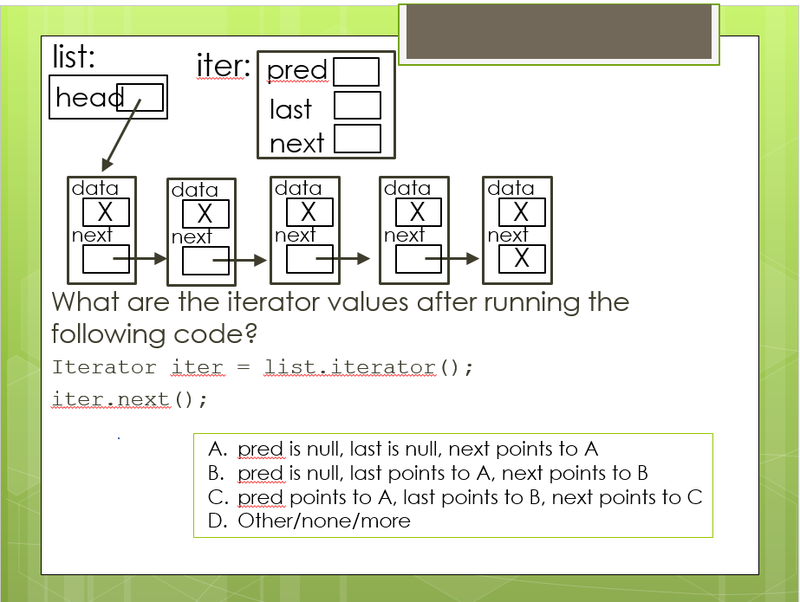 Object-oriented design including interfaces, polymorphism, encapsulation, abstract data types, pre-/post-conditions. Recursion. Uses Java and Java Collections. Number of Questions/Slides Available: Coming soon! CS2 in Java Peer Instruction Materials by Cynthia Lee is licensed under a Creative Commons Attribution-NonCommercial 4.0 International License. Based on a work at http://peerinstruction4cs.org. Usually I prefer to only post slides to this site after I have taught the course using the materials a minimum of 2-3 times. These slides were in their maiden voyage as it were. I won’t be teaching this course again, and many people have asked for these materials, so I have made them available. However, please be aware that they should be considered a rough draft and are likely suffering not infrequent bugs. Missing lectures were mistakenly overwritten and are not available.